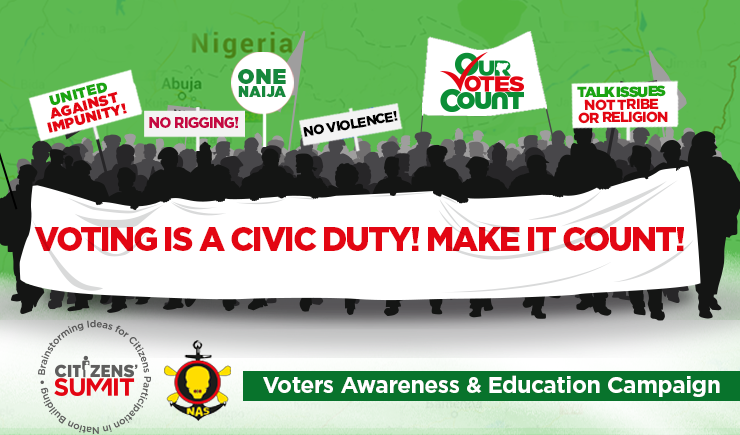 The #OurVotesCounts voter education and election monitoring project run by the National Association of Seadogs (NAS) was a laudable project that sought to help in the constructive actualisation of a “free and fair” general election and encourage voters to go the ballot with their conscience rather than their stomachs in the 2015 general elections. How wonderful! Who is leading or heading #OurVotesCounts project and NAS itself? He or they should tell the public how NAS conduct their elections. After all, they do have a president and should be transparent about their service to Nigeria and mankind. The question the Nigerian voters and the international community should seriously be asking is how does the NAS conduct their own biannual and annual elections? Does NAS have voter education for its members in its own elections? Are the elections of the NAS, open to monitoring and free from obvious manipulation? These are very important questions. If the answers to the aforementioned questions are positive, the National Association of Seadogs is “Noble” and should lead Nigeria with a good example of how elections are to be conducted. If negative they have to be “Ignoble” and quit the game before it catches up with them. So what is it? Noble or Ignoble? We shall not hear about #OurVotesCount again till the 2019 general election season starts when another opportunity for NGOs to make money for supporting the “right” political party under the guise of voter education and election monitoring presents itself once again. #OurVotesCount appears to be seasonal.